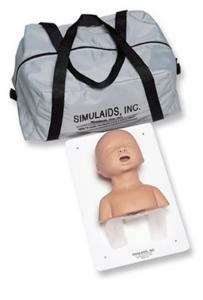 This trainer of an infant allows practice and training of nasal and oral intubation. Features include: Inflatable lungs and stomach, Vocal cords are highlighted in white for easy laryngoscope viewing, Anatomical landmarks such as uvula, vocal cords, glottis, epiglottis, larynx, arytenoid cartilage, trachea, esophagus. Supplied with carrying bag and lubricant.